Phil spoke to Digital Tour Bus about his guitar setup as part of their Gear Masters interview series. The interview was filmed on 25th February backstage at the Riverside Theater in Milwaukee, WI during the G3 tour. 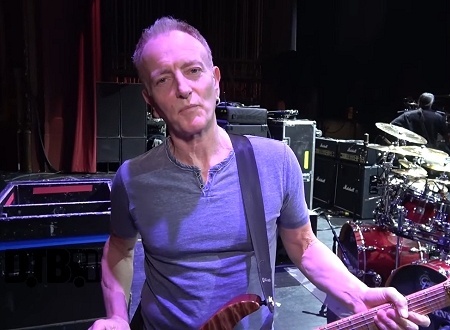 Phil talked about the G3 tour, Jackson PC1, Blackstar amps, guitar strings/picks, Fender Strat guitar, In-Ear Monitors, dressing room, PC1 Splatter guitar, Delta Deep rehearsals, Def Leppard's digital/streaming catalogue, 2018 tour plans, 2019 touring, Tesla album and Delta Deep album plans. He gives a tour of his guitar setup and Delta Deep perform a stripped down version of 'Bless these Blues' backstage in the dressing room. He also repeats the news that the 2018 Def Leppard tour will visit Japan, Australia and New Zealand between the end of the US tour and the December UK tour. Phil had previously stated that those countries have requested the Hysteria album show which means it will make its debut there rather than in the UK. 2019 plans for European festivals, more American shows and a return to South American were also mentioned again. Watch the full 15 minute interview below. "Got a bunch of things happening. Def Leppard just released our whole catalogue on digital. We re-signed with Universal our old label. So we're excited about that. That's awesome. The support has been crazy. Billboard catalogue albums. A couple of weeks ago we were Number One, Number Two and Number Three all at the same time. So that was a big deal so I guess that worked." "We'll also be touring with Journey for about six months starting. What's the first gig guys?. May the 21st in Connecticut and then that goes to the end of the year I think we're doing Australia, Japan, New Zealand and then its England. We're doing the whole Hysteria album in its entirety. With Cheap Trick who'll be supporting us." "And then next year we've got some European festivals. Some more American stuff and South America as well. So it's kind of. The next year and a half is busy." "And also new Def Leppard stuff. I've already started that as well."